This special Christian Morrisseau Original Art Auction will be something all Morrisseau collectors will not want to miss. An original painting collection with over 175 acrylic paintings. 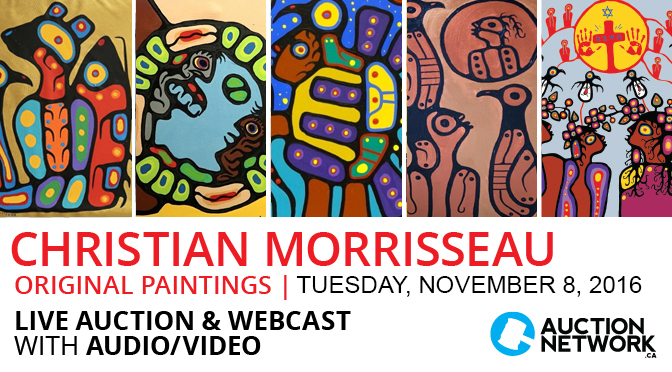 You will have the opportunity to meet the artist Christian Morrisseau at this special evening Morrisseau Art Auction. $500,000.00 Collection of over 25 NORVAL MORRISSEAU Original Paintings | Rare collection from early years. 6:30 PM EST | VIEWING FROM 5:00 PM EST. Always something new and exciting every week! PLEASE NOTE: New Early Start Time for Saturday & Sunday | 11:00am EST. We are proud to offer multiple major estate coin collections in this weekend’s sales including a collector of over 50 years’ gold coin inventory: Switzerland, France, United States Eagles, Prussia, Jamaican Struck at the RCM, Panama and Much More! Auction Items: Private Collection Sports Memorabilia, Nostalgia Collectibles including Limited Edition Guitar Pick Presentations, Die-cast Collector Vehicles (Corgi, Matchbox and More! ), Comic Book Collector Inventory, Brand New Radio Control Hobbyist Vehicles and Much More! Please visit www.auctionnetwork.ca for more information. We look forward to seeing you online or in-person this weekend!